As soon as I heard about this book, I said to my friend, "We need Slayer." For the next few weeks or so, whenever we saw each other (basically) one of us was all, "We need Slayer." So, this was an anticipated read for sure. I have to admit that I had to go back and refresh myself on what all happened with Buffy throughout the run of the show. This helped me as events and people were mentioned and then connected to Nina's story. Nina was an interesting character. She actually reminded me a lot of Evie in Paranormalcy. Sort of like the Becky Bloomwood (of Shopaholic fame) of things not quite living -- lol. One thing I simply adored about the story was the sister relationship. I'm really close with my sister, and I really enjoyed reading about the resiliency of Artemis and Nina's bond. Also, Leo was enjoyably swoon worthy. I listened to this one on audiobook, and I couldn't help but laugh at the reader's attempt of an Irish accent for some of the characters. A for Effort. 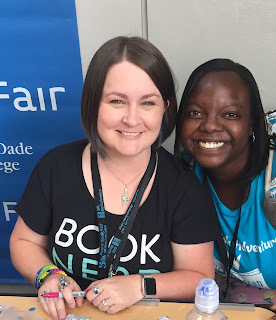 With author Kiersten White at Miami Book Fair 2018..
Fun fact: I have the exact same shirt she's wearing. I wore it the next day. Finally, several themes, characters, and elements of the story did complete 180s by the end of the book. I can't really get into it without spoilers, but it was just really need to see things that started at Point A on the left ending up at Point B on the right. 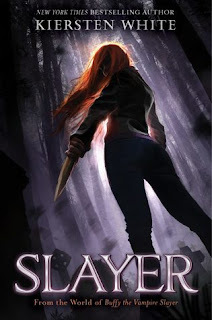 Oh, and naturally there was a big reveal at the end of this, so I'm looking forward to book 2!